Last month we described an amazing route along the seashore of Costa del Azahar, from Castellón to Peñiscola, and we talked about El Desierto de Las Palmas at the end of that route. But to be honest, that incredible area deserves an article all of its own. It’s called The Mountains of the Spirit because the monastery of the Carmelite Order was built there in the 17th century. They were looking for a peaceful place to make their spiritual retreat, and they found it close to Monte Bartolo, with an altitude of 729 metres, the perfect viewpoint over the surroundings and the Mediterranean Sea. Unfortunately, an avalanche of rocks after heavy rain destroyed part of the original building, and the Order decided to start the works for the new one in a different place. There are two perfect starting points to get to El Desierto de Las palmas close to last month’s route (a perfect excuse to extend our visit to the area). The first is just outside Benicàssim, on a well signalled road close to the N-340 main road, from which you cycle to Montornés. You don’t need to go into the village, but you can if you want to enjoy an incredible view over Benicàssim and the sea from the ruins of its castle. A few minutes after Montornés, there’s a road on the right, and a bit later, a fountain where you can refill your bottles while you take a look at Agujas de Santa Agueda, spectacular rocky mountains about which there are many mysterious legends. Keep on cycling and if you look to the left, you’ll discover Monte Bartolo, and probably some birds of prey flying around. At the end of this road, you’ll get to Pobla Tornesa… this beautiful village would be a perfect place to rest for a while, eat something or refill bottles. Then you can cycle on the road to Castellón for a few kilometres, and take a road on the left to get into El Desierto de Las Palmas again. This road will take us to another great viewpoint in Coll de Mota, before getting to El Refugio and the La Bartola Visitors Centre, the main info office of this privileged area. At this point of the route, you can cycle to the right to get to the other possible starting point for this route, just outside Castellón, with another interesting place to visit, the chapel of La Magdalena. 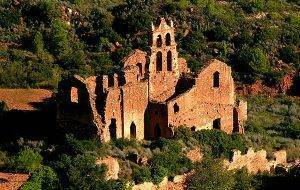 After the stop in the La Bartola Visitors Centre, continue to the next stop, the Monestir del Desert de les Palmes, the monastery described above. In the old times, the monks were working like farmers, but now they dedicate their time to brewing their famous liqueur and welcoming visitors to the monastery. Once you leave the spiritual centre of the area, you have to cycle to the left to Montornes and reach the starting point of the route. El Desierto de las Palmas is an area rich with wildlife. Rabbits, squirrels and lizards are common, as well as some birds of prey like the peregrine falcon. The vegetation is typical of the Mediterranean coast: pine trees, almond and alive trees, bushes and orange groves. This route, and last month’s, are two of the most beautiful and unspoiled in the Paris Valenciano, a must to cycle! !